Wearable devices that track the medical data of their users are becoming increasingly popular among both healthcare professionals and researchers. They consist of sensors that measure vital signs over time, which can help calculate the probability of deterioration in patients with conditions such as chronic obstructive pulmonary disorder (COPD). These tracking devices can consist of electrodes that remain attached to the skin over time, or infrared sensors that analyse pulse oximetry, or the amount of oxygen in the blood at a given point in the circulatory system. Both wearable types can be unobtrusive, but researchers and engineers think that they can be improved on in this regard. One group of scientists have developed a new type of sensor that can attach to a patient’s clothing rather than a specialised shirt to monitor breathing. 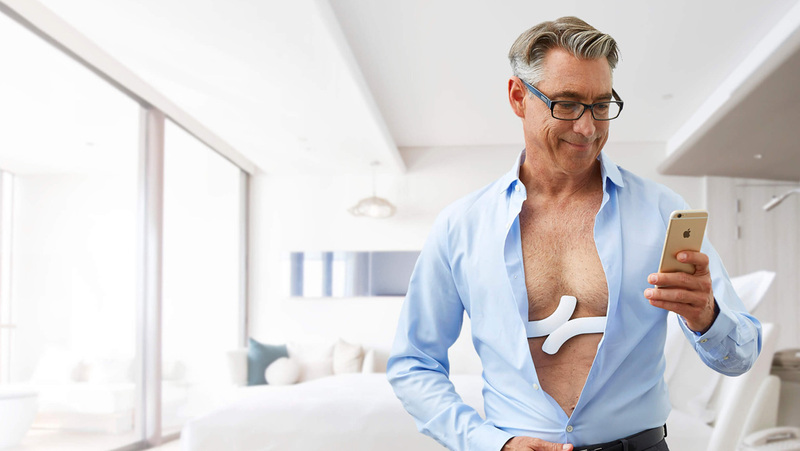 This new wearable also connects to Wi-Fi, so it can transfer data reliably and seamlessly without the patient’s help or input. The team hopes that this sensor type can reach a more commercial stage at which it can help more people with breathing disorders to track their respiration. Healthcare researchers have made great strides in the technology-augmented monitoring of vital signs, which help patients and their doctors track the progress of a disease. A popular example is the sensor type based on fibre Bragg grating (FBG) technology, which convert the vibrations associated with respiration and heart rates into usable data for analysis and presentation. Another monitoring standard involves sending radiofrequency waves through the body and analysing disturbances in them for chest movement. The resulting RF patterns are picked up using the ultra-wideband (UWB) spectral reception and analysis standard, which is a system closely resembling radar. However, these advanced medical tracking methods are complex and also need to be integrated into mattresses or cushions, on which the patient needs to remain motionless for protracted periods of time. FBG and UWB based tracking products are directed at patients in need of long-term respiratory tracking who are also mostly sedentary. Alternatively, they are useful as sleep-tracking platforms. However, they are less useful to patients who are capable of greater independent movement. People with conditions like COPD and who can move about freely for most of the day can still benefit from long-term monitoring for symptoms that might arise if their vital signs start to exhibit a downward turn. They have some options for wearable tracking devices, which mainly come in the form of electrodes, which are stuck onto the skin, or pulse oximetry trackers, which are often attached to a finger. However, devices that are worn on the skin for long periods may become annoying or irritating, and may fall off. Fingerclamp-like devices may also get distracting and impede everyday activities. Therefore, several research groups have investigated the potential of ‘smart’ fabrics as wearable breathing monitors. Smart fabrics are made of threads composed of fibre or yarn types that contain materials which can be optical, conductive or otherwise, out of which micrometric circuits can be woven. The resulting 2D microelectronics can then form the necessary components of a sensor, including vibration indicators or frequency generators such as antennae. The patterns of data can then be picked up by a complementary analyser (as with the FBG/UWB system) and converted to breathing data using the appropriate algorithms and data-collecting software. This is exactly how a team from the departments of physics and electrical & computer engineering at the Université Laval in Québec developed a completely wireless sensor that was integrated into a shirt. This sensor was used to accurately detect and monitor respiratory rates in healthy male human volunteers. Some groups have also integrated similar sensors into clothing, but have needed to connect these devices to electrodes onto the skin for reliable recording. This raises the issues of comfort that may discourage some from wearing breathing trackers, as outlined above. The team from Quebec, led by Younes Messaddeq of the Centre for Optics, Photonics and Lasers at Université Laval, made their sensor from hollow silica-glass threads coated in silver and polyimide. This material was formed into an antenna in a spiral form, broadcasting at 2.45GHz. The team incorporated their antenna into a plain cotton T-shirt, and collected changes in its resonance frequency to detect the breathing of the wearer. Therefore, their device was fully wireless and also as wearable as a normal piece of clothing. The team demonstrated that the frequency-shift patterns that represented both deeper and shallower breathing in a variety of normal body positions, including both standing up and lying down, were robustly transmitted to standard lab equipment and over short-range Bluetooth to a mobile device. For example, heavy breathing while standing was correlated to a resonance of 120MHz. These results, which are published in the May 2017 edition of the journal Sensors, may represent an encouraging move towards wireless, wearable sensors that may be more acceptable to users who want to avoid discomfort while monitoring their breathing. However, the study does have limitations; it involved only two volunteers, and there are indications that the accuracy of the sensor was affected by body position and different breathing styles in both men. Therefore, this sensor will need much more testing and validation before patients can integrate it into their clothes and go about their daily business. It will be interesting to follow the progress and potential of these new smart fabric-based sensors, especially as they may also have a credible role in tracking the vital signs of other patient types, such as new-born babies, in whom maintaining normal breathing is a critical medical concern. Guay P, Gorgutsa S, LaRochelle S, Messaddeq Y. Wearable Contactless Respiration Sensor Based on Multi-Material Fibers Integrated into Textile. Sensors. 2017;17(5):1050. Lazaro A, Girbau D, Villarino R. Analysis of vital signs monitoring using an IR-UWB radar. Progress In Electromagnetics Research. 2010;100:265-284.